Emotion and protest in Turkey: what happened on 19 January, 2007? Those gathering spontaneously after the assassination of Hrant Dink have been part of the Gezi movement — in a non-violent way, manifesting their desire to be the Subjects of their own lives. Hrant Dink..Adalet ( justice!). Demotix/J Kojak. All right reserved. The founder and editor-in-chief of the journal Agos, Hrant Dink, a Turkish-Armenian journalist and activist was shot on 19 January, 2007, at around 3pm, on Halaskargazi Avenue in front of his journal’s headquarters in Istanbul. The suspect was described as a young man – later identified later Ogün Samast: “age around 18-19, wearing blue-jeans and a white beret”. Witnesses heard three shots. When Dink was discovered lying dead, shot in the back of head, the perpetrator disappeared into one of the crowded back streets of Şişli. Dink’s body was left lying in front of the Sebat building for an hour before being moved to the legal morgue and to the Church Surp Asvadzadzin in Kumkapı. At that time, people gathering at the scene of the shooting were chanting slogans such as “Long live the brotherhood of peoples” – “Murderer state!” – “Those Hrants don't die!” etc. In the evening, protests spread throughout İstanbul and Ankara. Report of the murder carried far and wide in national and international media. The perpetrator Ogün Samast was arrested on the road making for his home town, Trabzon. The gendarme officers who arrested the murderer posed with him in front of a Turkish flag. That image reverberated through the social media. Public opinion was further shocked by the statement of the President of the Police Forces of İstanbul, who said of him: “That individual has no link with any criminal organisation: the assassination has no political dimension. It was an act committed out of pure nationalist sentiment.” In the days that followed this declaration, it emerged that Samast was involved in extreme right-wing paramilitary groups and that the police administration at different levels was aware of the planning of the crime. In these dark days when Turkey is once again hovering between its painful past and its hopeless future, the ninth commemoration of Dink’s assassination took place in Istanbul. That commemoration was an opportunity to express themselves for current ‘emancipation movements’ dealing both with the peaceful resolution of the Kurdish issue, and the right to equal citizenship for all who are different. In addition, solidarity has been extended to a wide group of academics attacked because of their petition in favour of peace and in support of the dissident Kurdish cities under curfew and repression for many months. New and subterranean movements of emancipation and democratization may have only become visible since the Gezi movement of 2013, but they have been stirring since the beginning of last decade and they have always converged strongly around Dink’s assassination protests. I would like to draw attention to this commemoration of Hrank Dink, not as a single or even a recurrent event, or as a single-issue manifestation; but rather as one of the inspirational and emotional sources of the Gezi movement — one of its invisible and unintended tributaries. In order to show how important Hrant Dink’s commemoration is to the renewal of social movements, their inspiration and creativity, I want to define it as a ‘moral shock’ and shed light on its complex emotions. It was a turning point. Collective action in Turkey was immersed and structured through this broad panoply of emotional mnemonics that arose from Dink’s assassination. Moral shocks are often the first step towards recruitment into social movements. [They] occur when an unexpected event or piece of information raises such a sense of outrage in a person that she becomes inclined toward political action, whether or not she has acquaintances in the movement. The emotions of such people are based upon collective experiences rather than personal memories or a direct affective bond with the victim. Cognitive processing, information gathering and the collective dimension of social and cultural grieving seem to construct moral concern. The collective resonance of this particular assassination poses questions. Why was Hrant Dink the target of this extreme nationalist attack, and why did his death have such an impact ? Sinan, a 50 year old communist party member, was nearly in tears when we asked him — four years after the fact — about the brutal assassination of Hrant Dink. He stated: “It should not have been him. Not him…” His reaction confirmed the popular sentiment shared by many, that Hrant Dink had become a symbolic iconic figure. Knowledge about Dink as a person offers more clues as to the kind of moral shock felt both in Turkey and abroad. He was not the first journalist or public intellectual to become a victim to violence or be pursued through the courts as a result of their political opinions. According to the Committee to Protect Journalists (CPJ), 20 journalists were killed in Turkey between 1992-2012; 78% of the murders have gone unpunished and with little follow-up, while 50% have suspected perpetrators reported to be government officials. My interviewees were convinced that he was condemned and killed because he was Armenian; hence their outrage and indignation, as my opening quotes show. They insist on the shame felt by the Turkish part of their identity at such a crime. Furthermore, Dink was an Armenian who spoke of peacemaking. He also occupied a peculiar political left-wing position, that distanced him from both extremes in the highly controversial debate about genocide within Turkey. His journal Agos was mainly focused on the need for mutual dialogue between Armenians and Turks. But Hrant Dink was concerned with human rights on the widest scale — and not solely Armenian rights or for the recognition of the genocide. It is this critical dimension that underscored his role as a public intellectual and a figure who would became associated with generalized political, cultural and moral protest. Soon, a narrative of vulnerability and innocence enveloped Hrant Dink, which increased the intensity of the moral shock at his assassination. State authorities had not provided him with security despite the many threats he received. On the other hand, Dink’s commitment to democracy and social justice made him a highly-respected journalist among left-wing democrats and beyond. On the day of the murder, hundreds of people rushed to the place where he had been killed. This gathering was spontaneous, an immediate reactive mobilization, without any organization. The slogan that gradually emerged from this crowd was: “We are all Hrant, we are all Armenians”. This moment of unification provided the possibility for common political participation. During six months of political campaigning for the independent candidate Baskın Oran in the 2007 legislative elections, people from different political affiliations worked together with apolitical people, in the name of their shared moral and universal principles. On the first day of this movement, one person observed that protest against these hate-crimes had the potential to go on the offensive. As Michel Wieviorka suggests, “the offensive aspect of the movement corresponds to the actor’s capacity to define a project, a vision or a utopia and, on the basis of a strong identity, to put forward an alternative conception of community life.” Social actors in this case were proposing the formation of new kinds of cultural and social bonds which would impact on their sense of history. These emotions are transmitted through the media and one of the powers of new communication technologies is to put forward shocking images. In fact, one of the first photographs widely available in broadcast and social media on the day of the shooting, showed the body of Hrant Dink taken from a low angle, as he lay in the street. His feet were in the foreground; his bloody body covered with a white fabric. The hole in his shoes was visible and has afflicted everyone. This is far from being a meaningless detail because every single person we interviewed noticed it. This image had a symbolic value which led to identification with and compassion for Dink: he was an ordinary man, from the lower middle-class. He was devoted to peace and reconciliation and far from pursuing his own material or communitarian interests. On 20 January, newspapers and independent media sources published the last chronicle by Dink for Agos. In this article he spoke about the death threats he had received and his anxiety over them. He compared himself to a ‘fearful pigeon’ in the streets, hoping that he could go on living in this country, fearful yet free. He also declared that he could never accept being turned into a racist against his compatriots and that he would seek justice through the European Court of Human Rights (ECHR). The metaphor of the ‘fearful pigeon’ to describe his emotional state was transmitted through the full range of media outlets, ushering in yet more waves of compassion. This metaphor provoked a strong affective identification. In the context of moral shock, identification with Dink led to identification with the broader Armenian community. In fact, it became a symbolic conduit for all in the struggle against the nationalist cultural order. Emotions are not irrational: they must be understood as conduits for action. The possibility of identification with an Armenian, the compassion and panoply of emotions triggered and sustained during this mobilization, reveal the dynamics of a cultural movement in which the emotions of the individual contain the potential to generate a subject claiming rights in the name of values. In sum, ‘moral shock’ gave rise to primarily negative emotions converted into collective motivational energy by the revitalization of old political affinities, as well as the creation of new ties between distinct movements and groups. From moral protest to ‘emancipation movement’? The moral protest after the murder disclosed the unfurling of a broader cultural movement in Turkey. 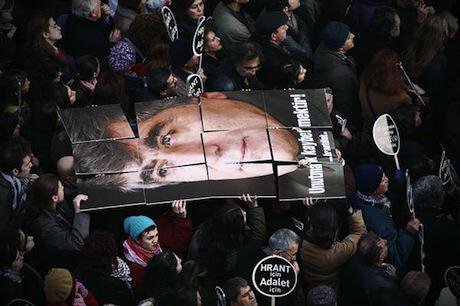 Though wide in its implications, and indicative of the fragmented nature of Turkish civil society, the aftermath of the Hrant Dink assassination is one case amongst other previous mobilizations that contained similar repertoires of action and of demands. Many fragmented initiatives, campaigns and organizations within Turkish civil society have in common an emerging grammar of collective action, based upon the autonomy of the individual and what Touraine has called the affirmation of the subject. They also have in common the recognition of claims for justice that direct us to the revitalization of social memory. The growing interest in memory, in and around struggles against official history, has become evident in the way activists reinvent their militant and organizational practices. Subjectivity is expressed through the blurring of identities: for example when hundreds of thousands of people are united under the slogan “We are all Armenians”, or when they research into the complexity of their origins and multiple identities. This reconstruction of memory is not based upon rigid collective identities but on the “public experience of self” as Kevin McDonald describes it, the “fluidarity versus solidarity” that characterizes the organisation of cultural movements. In this case, each individual is implicated in the movement through personal emotions, moral shock or other affective bonds. Self-narratives of the recollected past and the affirmation of an individual’s autonomy against state-imposed identities become manifest in the human affinities created during occasional mobilizations or gatherings. This process creates new subjects when it leads to constructive, reflexive collective actions with embedded meanings that can revitalize social, cultural and political life. 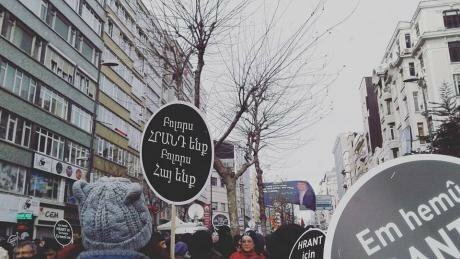 One example of mobilization that followed the moral protests in the aftermath of Dink’s murder, tangibly demonstrates how self-affirmation and shared emotions open new paths to activism. On 24 April, 2010, for the first time the Armenian genocide was commemorated in a public space in Turkey. Intellectuals and leading figures, who were already the co-organizers of the funeral of Dink and the political campaign of Baskın Oran, worked together in order to express their shared emotions in a public space. This act of mobilization was deeply performative, in that it was a mise-en-scène of collective mourning. The emotions of anger and outrage that were transformed into grief and sorrow during the funeral of Dink, and later at every commemoration of his death, were again performed in the public sphere. In the most crowded central Taksim Square in Istanbul, hundreds of individuals gathered together for a ritual of mourning. Dressed in black, holding candles and flowers, they stayed half an hour for a risky yet silent sit-in, whilst nationalist opponents were singing the Turkish National Anthem at the other end of the square. Nobody pronounced the word ‘genocide’ because the organizers opted for the expression “Great Crime” (in Turkish, Great Catastrophe), as a literal translation of the traditional Armenian expression. This commemorative action was also a turning point, not only for the revitalization of social memory, but also for political activism. What is the meaning of this rational mise-en-scène and performance of a mourning ritual? What kind of collective action is it? It is designed to create compassion amongst citizens, compassion as a necessary emotion for democracy and pluralism. By contrast, standard political demonstrations, marches under banners and slogans are rejected, in favour of using silence and embodiment as activist tools. Without the moral protest and the strategic, rational processing of emotions by the movement leaders, such a commemoration would be impossible to imagine, experience or organize. During the sit-in in 2010, participants experienced being ‘the other’ of Turkish society: not only an Armenian but an individual able to feel compassion, grief and sorrow with the other, able to share the sufferings and the memory of the whole Armenian community. Historical memory and autobiographical memory are in this case intertwined because without the direct, personal experience of the assassination of Hrant Dink, the meaning of the actions would have been limited to a defensive cause: the struggle against hate-crimes and discrimination. The moral protest, buttressed by the emotion of the participants, leads instead towards a deeper aspiration for social transformation: one that speaks of a pluralistic democratic society, respect for cultural differences, freedom of speech and active citizenship. 19 January, 2016 in Istanbul, where the commemoration gathers. Author’s photo. The moral protest that followed the assassination of Hrant Dink on 19 January, 2007 was a turning point in the reflexivity of Turkish society and its ability to transform itself. Politically fragmented, culturally oriented movements have already been stirring for two decades: e.g. feminist, ecologist, alter-globalization movements as well as Kurdish cultural rights movements and other dissident protests. Movements for the defense of human rights, freedom of expression and cultural differences reached their climax during the mobilizations around the death of Hrant Dink, which also crystallized social memory issues. State-imposed amnesia about the Armenian issue confronted the community’s narratives, along with the explosion of Dink’s murder. Likewise, recently the Turkish left has become more and more intrigued by its own political memory. The once rigidly-structured revolutionary movements and utopias have vanished and inquiries into their failure have outed the emergence of memory claims against official history. These occur through new representations of the past in media, art, cinema, film, literature, popular culture and intergenerational transmission. Correlatively, the interpretation of the military coup d’état of 1980 — and the representation of this past from the viewpoint of its victims — displays new objectives and confers new meanings on activism. The Gezi movement also revealed new transformative effects of social movements in Turkey. The aspirations for the respect of cultural differences, the demands of democracy and freedom, and the refusal of current economic development models has never been so intertwined in former mobilizations as is now evident. Since then, it is possible to outline a certain continuity between the particular moral protests of the aftermath of Hrant Dink and the wider Gezi movement that was firstly a non-violent uprising against authoritarianism and police violence. This then provoked an intense indignation similar to the outrage felt after Hrant Dink’s assassination. This was despite the fact that the emergence of the Gezi movement was wholly unpredictable in nature, the result of contingency, and the numerous fragmentary and smaller cultural movements that have been active in Turkey over the last two decades. All these fragmented movements (i.e. alter-globalization activists, initiatives of intellectuals in favour of freedom of speech, human rights and minority rights as well as mobilizations against neoliberal urban planning) share similarities in their grammar of collective action: creative, joyful, convivial, humorous components of resistance in Gezi Park are formally similar to the mise-en-scène of mourning in the aftermath of Dink. In addition, a totally new martyrology is observed: portraits of citizens who lost their lives during Gezi are the new figures of our social memory raised next to the images of elder martyrs of the revolutionary leftwing movements since the 60’s. The same individuals and small groups that gathered spontaneously after the assassination of Hrant Dink have been part of the Gezi movement. They have protested in a non-violent similar way: through embodiment and with creativity. They have manifested their desire to be the Subjects of their own lives. At the same time, they are against the authoritarianism that intervenes into their most personal and intimate decisions (recommendation from PM regarding the minimal number of children that women should have, the debate on the banning of abortion, the restriction on alcohol sales etc.). The blurring of identities is also more visible today. Nine years ago the slogan « We are all Hrant, We are all Armenians » was a turning point. Today some of the Gezi resistance protesters are capable of defending the rights of different oppressed categories of citizens (Armenians, Kurds, Women, LGBTT, but also victims of neoliberal urban renovation projects), and not only their own rights. Today, on 19 January, the participants in the commemoration of Dink are capable of struggling against oblivion, violence and impunity, but also capable of defending the rights of Kurdish citizens as well as those of the academicians defending Kurdish people. The emancipation movements recognize now that there is no such thing as solitary emancipation. NB: A first version of this analysis was published under the title «Emotions, memory and new cultural movements in Turkey», in: Antimo L. Farro and Henri Lustiger-Thaler (Eds. ), Reimagining Social Movements. From Collectives to Individuals, Ed. Ashgate, 2014. The author is grateful to professors Hamit Bozarslan, Henri Lustiger-Thaler and Antimo Farro for the initial book version and the editor Breno Bringel for the updated OpenMovements edition of the present article.